Fun Stampers Journey Holiday Blog Hop – Welcome! Welcome back to my blog and this months Journey Holiday Blog Hop! If you arrived here from Crissy’s blog then you are right on track. If not just keep hopping right along & you’ll come full circle. This month’s theme is holiday and I chose to do something a little different. I decided to use the Bloom Cluster die, some Cranberry Bliss & some Pearled Basics paper in white to create my focal image on my card. I started with a Limeade Splash card base. 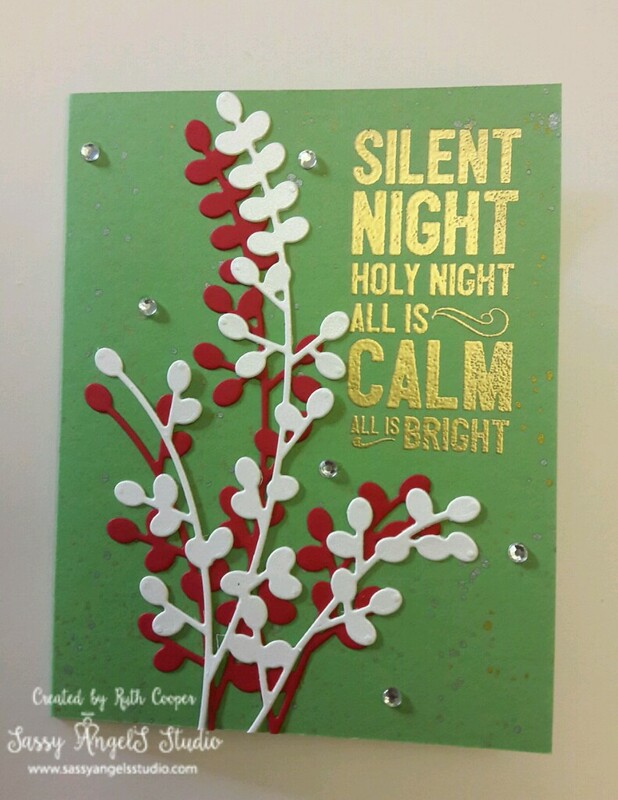 I embossed Silent Night from the Oh Holy stamp set in Gold Embossing powder. I then added a splashed background with my Gold & Silver Silks. I attached my Bloom Cluster die cuts & a few rhinestones for a simple elegant card. As you read this, I am traveling home from a Christmas trip to Nashville Tennessee. I took very limited supplies with me on my trip. This helps me think outside the box. It also shows that with just a few items & one holiday stamp set that you can create a variety of cards on a budget. Creating can be as budget friendly as you need it to be, while still allowing you to add in a new purchase here & there to your stash. For the New Year, take a fresh look at your supplies & see how many possibilities are there. When you pick up a new purchase think of how many different ways you might be able to create with it. A good suggestion is if you can make 3 different projects with it, it’s a good purchase. Stayed tuned for the new Bloom This Way mini catalog launching Jan. 1st. You might just find a new supply or 2 that might have endless possibilities for creating. Hop on over & check out what Kim Lamos has created. Thanks for hopping by! Have a truly Merry Christmas! Beautiful card. I love that you used the Bloom Clusters. Beautiful card! love the Bloom Cluster Die.